NYC, 11/09/2018, 5:15PM. A tribute to Duke Ellington, Miles Davis, Thelonious Monk, and more. 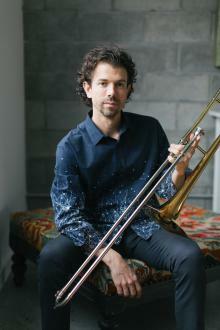 Ryan Keberle is a trombone player, composer, arranger, and educator. Described by The New York Times as a "trombonist of vision and composure", Keberle has worked with David Bowie, Maria Schneider, Wynton Marsalis, Darcy James Argue, Alicia Keys, and Sufjan Stevens, among others, and has appeared on five Grammy Award-winning records. Ike Sturm is a bassist, composer, and bandleader. He has worked with Gene Bertoncini, Donny McCaslin, Bobby McFerrin, Ben Monder, Ingrid Jensen, Steve Lehman, Maria Schneider and many others.